The sensex crossed the 37,000 mark during intraday for the first time on the back of improved earnings from listed companies. The National Stock Exchange’s benchmark Nifty rose 35 points to close at an all-time high of 11,167. 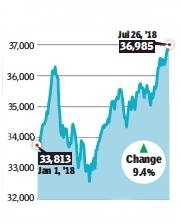 The sensex opened at 36,928 and touched an all-time high of 37,061 before closing at 36,985, a 126-point increase over its previous close. The sensex has gained 8.6% in 2018 making it Asia Pacific’s best performing market. According to Bloomberg, the April-June earnings season has had a mixed start.Net income at 10 of the 19 NSE Nifty 50 Index companies, that have reported so far, have met or exceeded estimates. A stronger rupee also improved sentiments in the equity market. Most emerging market currencies gained against the dollar after a trade truce between the US and Europe boosted market sentiment. The rupee rose by 13 paise to close at a fresh one-week high of 68.66 against the US dollar. Forex dealers however said that rising crude prices will continue to keep the domestic currency under pressure. Analysts said strong liquidity in the market, following unabated buying by domestic investors and better-than-expected Q1 earnings by some index pivotals, lifted the mood. Covering-up of pending short positions on expiry of the July derivatives contracts and a strengthening rupee propped up the markets at high levels, they added.